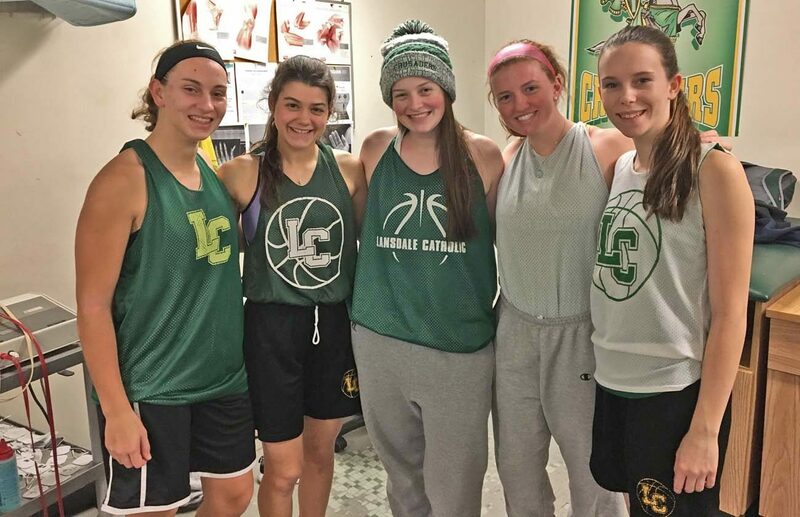 Key players on the Lansdale Catholic girls' basketball team include, from left, Laura Vetter, Megan Maloney, Holly Schneider, Lindsay Rock, and Miranda Grant. The game had been over for about 15 minutes, and Laura Vetter emerged from the locker room. The scoreboard had already been turned off, not that she wanted to be reminded of the final score. Thursday night, Feb. 17 at Cardinal O’Hara, the Lansdale Catholic senior played in her last Catholic League game, a 62-36, playoff quarterfinal loss to the host Lions. Disappointed about the outcome, but being a realist and not particularly surprised, Vetter set her mind to the upcoming PIAA District 12 tournament. Unless Bonner-Prendergast defies the odds and wins the Catholic League championship, Lansdale Catholic will be the Division 4A representative from the CL. That Vetter used the possessive pronoun “our” instead of “my” speaks volumes about the parishioner at St. Philip Neri in Lafayette Hill. A transfer from Perkiomen Valley High School after her sophomore year, Vetter has established a reputation as a team-first contributor. It’s an attribute that hasn’t escaped Lansdale Catholic coach Joe Mack. Even though her career at LC is likely not over, a voluminous chapter has come to an end. Against O’Hara, which will face Neumann-Goretti in next week’s semifinals, junior Brady Wassel scored 11 points and Lauren Crim added nine for the Crusaders. Wassel and Crim share team captain with seniors Lindsay Rock and Megan Maloney. Vetter, a point guard, led the team in assists, a statistic to which she has become accustomed over the past two seasons. Playing in a league with so much talent, Vetter said, provides her and her teammates confidence and fortitude. “Most leagues have those one or two teams that are the usually the top contenders for league championships,” said Vetter. “As for the PCL, it is a little different in the fact that a lot of the teams aren’t just playing for league titles, but states also. Vetter’s coach expressed a similar outlook. Contact John Knebels at jknebels@gmail.com or on twitter @johnknebels.